This 400-square-ft traveling exhibition engages Seattle-area school groups, families, and tourists in the ongoing effort to re-introduce fishers to their original habitats throughout the state. 'Homecoming' was a collaboration between me and Klondike Gold Rush National Historical Park- Seattle Unit, where it was installed from May - December 2017. Fishers (members of the weasel family) were expunged from their old-growth forest habitats in Washington by the mid 20th century. The logging industry, fur trade, and pesticides were all detrimental to this animal,, which is particular about its mating and denning habits..
Over the last decade the National Park Service has partnered with the Washington Department of Fish and Wildlife, the US Forest Service, many Northwest tribes, and private landowners to bring fishers safely from Canada and oversee their sustained re-introduction to forests around Washington state. i worked with klondike over the course of several months to make this exhibit come to life. Visitors use this field guide to find species hidden in this mural of a fisher ecosystem. Each illustration was contributed by a local scientific illustrator, thanks to a grant I won from the Seattle Office of Arts and Culture. My research on the re-introduction involved interviews with wildlife biologists, trips to national parks, and poring over published reports. All of this was condensed into a few interpretive labels like this one. I illustrated and designed the exhibit logo. Successful reintroduction means making sure fishers have the perfect spot to raise their kits. They den in dark, secluded areas like old logs. In the spirit of revitalization, we made it a nurse log, using a Sonotube and lots of epoxy. It breaks down into segments so that it can travel to a fisher reintroduction site near you. I illustrated the line-work of the mural, and designed it to accommodate these stump graphics. over 100 visitors helped to make the mural. During a Pioneer Square First Thursday, art-walkers popped into Klondike to splash this forest with one of 19 colors. I wrote a number on every leaf and crevice... well, almost all of them. By the end of the painting process, people were comfortable enough to enjoy coming up with their own solutions for questionable areas. To me, that's a participatory success story. Here's how I made the linework for the mural. Rough sketches were made with the proportion of stump-text to whole mural in mind. 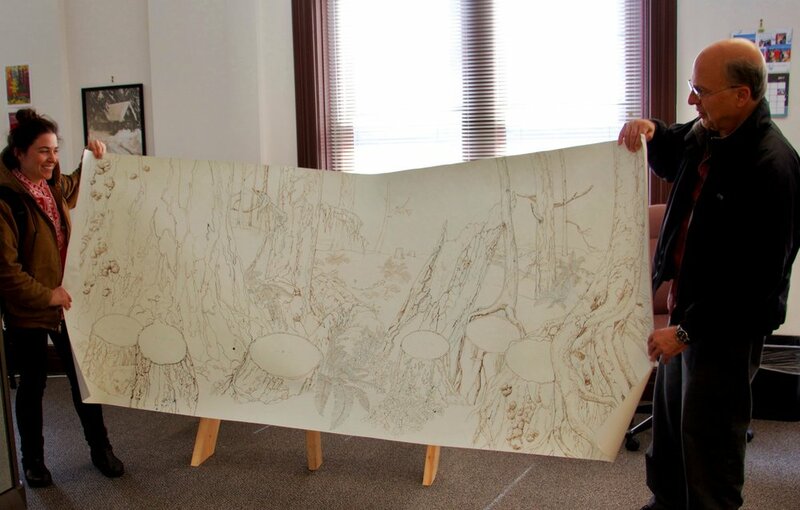 These sketches were translated to paper 1/3 the size of the final mural. It covered my entire tiny studio. I roughed in the line-work with a non-photo blue colored pencil, which doesn't (exactly) show up when you scan it in with ink on top. Then I drew on top of the non-photo blue with brown walnut ink and a good old-fashioned nib pen (hence the splotches.) Walnut ink allows for some layering of darkness, and the nib allowed for organic variation in line weight and a classic natural history aesthetic. My dad and I, holding up the whole ink drawing at Klondike. Next, a color scheme. I needed to simplify it enough so that people could easily help paint. The mural called for tons of green and a springtime palette. I wanted to evoke the smell of damp duff. Finally, the thing got printed onto canvas. The print company had to do it in 6 separate panels, which made it easier for lots of people to work on at once. When I heard a group of girl scouts exclaim to each other that their handiwork was going to be in a 'real exhibit', and when families worked together with other families--all ages next to each other--I considered the project to be a success. Or at least pretty fun. If I did it again I would give out takeaways reminding visitors that they can help rebuild a REAL ecosystem, by getting involved with the fisher reintroduction themselves.